Help & support / I need to cancel my event, what do I do? 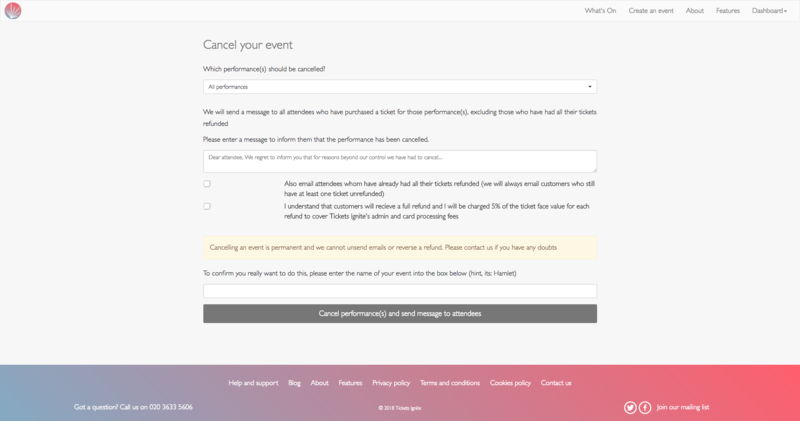 If you need to cancel an event, click 'Cancel' on your dashboard for the event which you need to make a cancellation for. Select which performance(s) you have to cancel, type out a message which will be sent to everyone who has purchased or booked tickets for those performances and when you confirm, everyone will be notified and will automatically receive a full refund. We’ve seen in the past that some organisers have processed refunds before cancelling an event, so we also made it possible to additionally email customers who have already received a refund. When you’ve cancelled just one performance, it will still appear on the event listing page but marked as cancelled. This is so any attendees who want to check the status of the performance will be able to confirm that it has been cancelled. Nobody will be able to book or purchase any tickets for a cancelled performance. If you have had to cancel an event just before it was due to happen, organisers you can now see the phone numbers of attendees in your attendee list and make the necessary phone calls to ensure your attendees know. Adding a phone number is optional for customers but around 77% of customers voluntarily add it.